Our second visit of the day was to the second-generation Lotte World complex, which included the Lotte World Tower and Lotte World Mall. At 556 meters and 123 stories tall, the Lotte World Tower will be the tallest building on the Korean peninsula when complete, taking over the title from North Korea’s Ryugyong Hotel. 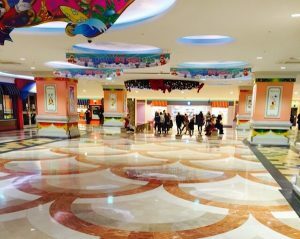 The Lotte World Mall features approximately 1,000 stores in the 11-story commercial building surrounding the tower, a 21-theater cinema, Lotte Mart, Lotte Duty Free, and Lotte World Aquarium. While the Lotte World Tower is still under construction, scheduled to complete in 2016, the Lotte World Mall opened in October of this year. 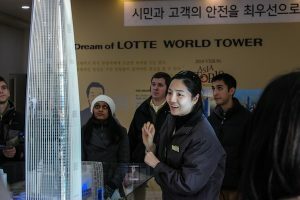 Our tour today consisted of a visit to the official Lotte Tower visitor center, where we learned about the design and construction of the building, as well as a walking tour through the completed and open Lotte World Mall. 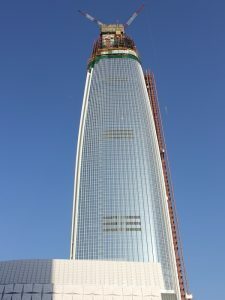 After 13 years of planning and site preparation, and even more years of conceptual design, the Lotte World Tower broke ground in March of 2011. While the building underwent many conceptual designs from architecture firms such as SOM, RTKL, and Pelli Architects, the architect for the final design is Kohn Pedersen Fox (KPF) based out of New York City (with BAUM Architects as the Architect of Record). The developer of the project is Lotte Engineering&Construction, with the $3.5 billion dollar price tag footed by The Lotte Group. The contractor is Lotte Construction Management. The structural engineer on the project is Leslie E. Robertson Associates. Other key players include SYSKA Hennessy Group as MEP Engineer, ALT Cladding for the facade, and RWDI as wind consultant. Presently, the Lotte World Tower structure has been built to approximately the 80th floor. The tower features a concrete core (with double-decker elevators) and a steel structure. 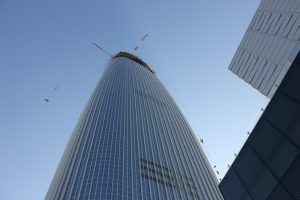 As a true mixed-used development, the Lotte World Tower includes not only the extensive shopping mall at its base, but prime office space from floors 14-38, luxurious private residence from floors 42-71, a luxury 6-star hotel from floors 76-101, private offices from floors 107-114, and an observation deck from floors 117-123 including a skywalk overlooking south Seoul. The gross area of the tower is 807,686 square meters. Built to the LEED Gold standard, the Lotte World Tower features many sustainable features including building integrated photovoltaic, vertical-axis wind turbines on the top floors, geothermal heating and cooling, and heat pump system using water from the neighboring Han River. When completed, the Lotte World Tower will be the seventh tallest building in the world, just beating out the tallest building in the United States, One World Trade Center. The tower is located next to the existing Lotte World complex in Seoul, south of the Han River. 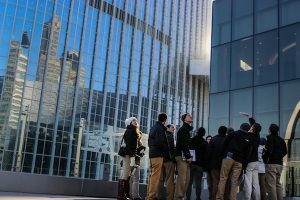 While we were unable to tour the actual construction site, our tour of the visitors center included an explanation and video showcase of the building design, features, and its significance. Through its construction, the project will require 4,000,000 workers, and upon competition, will create 20,000 permanent new jobs. 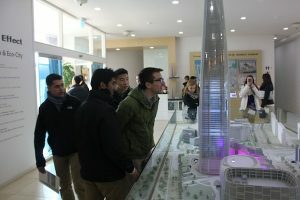 The Lotte World Tower will serve as the future focal point of Seoul, drawing an estimated 50,000,000 visitors a year.